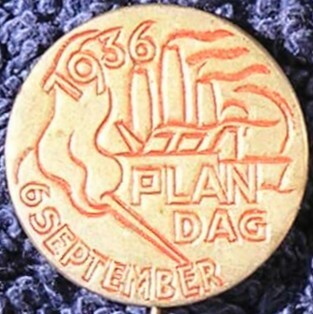 This column describes the plan of labour, which in 1935 is propagated by the political party SDAP in order to mitigate the effects of the economic depression, and in order to generate an upturn. 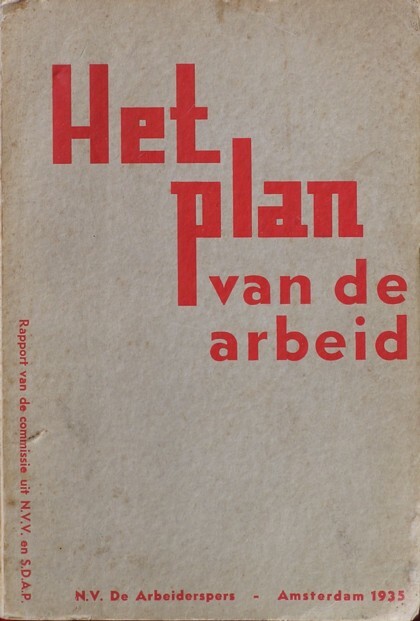 Both Het plan van de arbeid and the Handboek voor het plan van de arbeid have been studied1. Several criticisms are also discussed. In essence, the crisis-plan is the policy to increase the purchasing power, which later has been underpinned by the theory of Keynes. Furthermore, the plan-report contains a structure-plan, which aims to create an economic order consisting of the PBO. This is actually the recapitulation of the corporatism, which has already been advocated in previous reports. As is usual in columns about history the considerable length is caused by the many citations in the footnotes. If desired, the reader can ignore them. The plan of labour is again relevant, now that Europe and especially the Netherlands suffer from a protracted stagnation or shrinking economy and from a high unemployment. It is fascinating to analyze the intertwined nature of economics and the ideology in the policy plans of the time. Moreover, the various plans are unmistakably characterized by a certain political opportunism. The driving force behind the report is Hein Vos, who is especially for this project appointed as director of the newly established scientific office of the Sociaal-Democratische Arbeiders Partij (in short SDAP). He addresses the problems in an ambitious manner. His basic assumption is, that a plan "which is of considerable energy and size, will sooner gain the support of the majority of the people than a proposition of a limited and hesitant intervention"2. A hallmark of the plan is the leading role of the state. The social-democracy defends the democracy, because she hardly disposes of an economic or spiritual power base of her own, contrary to her political opponents. Yet this dedication is not self-evident. Even in 1921 the party ideologist Rudolph Kuyper states that the democracy is merely a means for the realization of socialism3. The authors of the plan report claim the right of the state to correct all kinds of external effects of the private sector. But also for other reasons the report prefers a state dirigism. The protestant economist P.A. Diepenhorst states, that due to the plan the class struggle is replaced by the state socialism. The plan contains paragraphs for the agriculture and the shopkeepers. This is an attempt to bind new target groups, so that the SDAP obtains a wider support. For, the elections did not yet yield a majority. In the meantime, it has become clear, that the middle class will not perish, contrary to what the theory of Marx expects. Besides, the fascist coup d'état in Germany has shown, that the desparate middle class threatens to become a danger. It is obvious, that this widening of the social-democracy is criticized, among other by marxists such as Sam de Wolff. The resistance against the plan will be explained further at the end of the column. In fact there is no alternative, because the prolonged failure to make a political breakthrough would undermine the credibility of the socialist prophecy. The social-democratic professor G. van den Bergh, among others, stresses, that the crisis plan is not socialist, but the structure plan is. Even within the labour mouvement itself the crisis plan is somewhat controversial, because it proposes the then new instrument of stimulating the spending power. Besides the enthusiasm of the young propagandists (H. Vos, J. Tinbergen, M. van der Goes van Naters) there is the distrust of a part of the old guard. For instance, the authoritative Jan Oudegeest sees no reason for a crisis plan by the SDAP. In his view she must restrict herself to the propaganda for the new social order and structure4. Indeed the plan has never been realized, and it remained on the drawing-board of Vos. The structure plan in the report does not add anything new to the proposals, that have been done before in the reports Het socialisatie-vraagstuk of 1920 and Bedrijfsorganisatie en medezeggenschap of 1923. The SDAP still pleads in favour of the public branch associations (in short PBO) as the corner-stone of her view on the state. The PBO (the branch councils, in short BR, joined in the Central Economic Council, in short CER) must prevent, that crises occur. However, some tasks of the PBO are elaborated further in the plan report than in the previous reports. In particular, it is mentioned that the PBO can mitigate the crisis by preventive actions, the so-called conjuncture policy. The PBO is less intrusive than socialization, because merely the power to manage the private property is restricted, and not necessarily the property right itself. The establishment of the PBO has also been proposed in the mentioned reports, but in the plan report it becomes a true alternative for socialization. The choice for the PBO has some public support, also in other political parties, and therefore can soon be realized. Meanwhile, the Great Depression since 1929 has ruined the economy to such an extent, that there is a willingness to experiment. A further deterioration is hardly conceivable. And the PBO can serve well in the execution of the crisis plan. Indeed the inventors of the plan are driven by the desire to become truly active, if possible in a coalition government. The plan elaborates on the hierarchy of the PBO5. The CER must be able to manage the investments, and therefore the (national) Nederlandse Bank must be socialized. Thus a central bank is created, that is subordinate to the CER, and that can influence the supply of credits from the commercial banks. Moreover, an industry bank is erected, that must stimulate the industrialization by means of credits, and that is also subordinate to the CER. The already existing Labour Fund is also subordinated to the CER. A Conjuncture Bureau and economic-technical institutes will be created with the task to advise the CER. These advisory bodies have indeed been realized, in the form of the het Centraal Plan Bureau (in short CPB) and the stichting voor toegepast natuur-wetenschappelijk onderzoek (in short TNO). An interesting model is proposed for ordering the foreign trade. Namely, the free trade will be replaced by bilateral exchange treaties. This is called the ordered exchange. Then in principe the trade is in kind, and no longer monetary. The two trading partners are not bothered by the price on the worldmarket, and can take into account their national interests and needs. This model guarantees, that the import and export always remain equilibrated. Moreover, it simplifies the planning6. Later the same system has been used in the mutual trade between the Leninist states, and also in the trade of those states with the capitalist world. Perhaps it is not surprising, that this model performs poorly. Planned economies (and also the plan of labour) attempt to produce products mainly in the interior. The ordered exchange is only possible, when a monopoly is established for the foreign trade. The BR (branch council) of the branch association determines the volume of imports and exports, perhaps after consulting the CER. Interesting is also the price formation. In the preceding socialization- and ordering-reports the BR is supposed to determine the product price for its own branch association. In the plan this idea returns, and for instance the prices in the agriculture will be computed on the basis of the production costs. This operational model looks like a circular system, so that your columnist doubts its feasibility. The plan does create some room for the operation of markets. But still the ordering must take care of the stabilization of the domestic market, which moreover must be able to absorb the conjunctural shocks from abroad. The state must mitigate the conjuncture by means of a policy of anti-cyclical state investments. The taxes and the credit policy of the central bank are also instruments of the conjuncture policy. This policy will be delegated partly to the CER. The mentioned Conjuncture bureau supports the policy with predictions of the future development of the conjuncture. Besides, the bureau conducts market analyses. So it is really a planning agency. The branch associations are engaged in the conjuncture policy in various manners. For instance, reserve stocks of the agricultural products can be formed. The plan combines the ordering, the controlled growth and the rationalization of the production. Thanks to the rationalizations the labour productivity increases, so that the welfare level can rise. Unfortunately they are often accompanied by the lay-off of workers. Therefore the plan states, that the rationalizations must be socially profitable. In other words, the rationalization must not shift the costs to the society. The superfluous workers must pbtain half-pay, be retrained, and new employment must be created. All these expenses are a part of the costs of rationalization, and evidently reduce the profitability. The authors of the report accept, that in this manner the rationalizations are discouraged. In a similar manner they want to order the agriculture by furthering the sales of small farms at the expense of the large (more efficient) farms. Sometimes the plan report chooses other priorities than the previous SDAP reports. The reduced attention for the socialization of private property has already been mentioned. Furthermore it is argued, that thanks to the rising living standard a differentiation of needs occurs. In the previous reports the standardization of products is still recommended. And the report expects that the employment will shift from the agriculture to the industry, partly consisting of shopkeepers and small entrepreneurs. The mentioned industry bank must support this development, also because the young industry is still fragile. And the retail trade maintains its position in the distribution. It does need to be ordered by means of a policy for business establishments, so that shopkeepers must dispose of a permit7. The heart of the crisis plan is a state intervention for increasing the spending power. Nowadays this policy would be called Keynesian, but in fact the idea had already surfaced before the publications of Keynes. An example from 1933 is the New Deal policy of the American president F.D. Roosevelt. Therefore the finds of Keynes are not mentioned in the plan report. The plan does use the multiplier theory, which had just been published by R.F. Kahn, a collaborator of Keynes. In the column about the Harrod-Domar model it is explained that according to the theory the investments will affect the spending power. Also the then Dutch government acknowledges the importance of investments, and has reserved capital for reducing the unemployment. In the column about the provision of work in the thirties of the last century it is explained, that the Work-fund is formed in order to create work. It consists of 60 million guilders and aims truly to further the employment. On the other hand, the provision of work aims to protect the morals, so that the economic effects are of secondary importance. However, this policy of spending power remains rather poor, because the price stability is the absolute priority of the government (just like nowadays). In the introduction is has already been remarked, that Vos prefers an active approach. The plan of labour wants to create more work, although it also wants to maintain the provision of work. The rise of the spending power must be paid by borrowing 600 million guilders, spread over three years8. Thus the state debt, which at that moment amounts to 38% of the gross national product, will rise to 50%. In the present perspective this is a desirable level9. But at the time such a debt was outrageous. Diepenhorst is right, when he doubts that such a policy will lead to a recovery of the trust among the entrepreneurs and investors. The report argues that the state debt will not be a burden to later generations. Namely, the large-scale works must all be socially profitable, and thanks to the fallen costs (due to the depression) this is often the case. The borrowed capital will be accompanied by a simultaneous policy, that aims at redistribution. For instance, the inactive incomes (rents from houses, land, and interest capital) will be reduced with about 20%, because this creates additional room for wages10. And the working-week is reduced to 48 hours and possibly even to 40 hours. The number of unemployed is reduced by raising the limit for compulsory education with an additional year, and by encouraging the retirement. Sometimes the accompanying policy has striking consequences. For instance, the structure plan want to slow down the rationalization. In the same spirit the crisis plan accepts, that already realized rationalizations are undone! In this respect notably the sigar makers are mentioned. This proposal has the smell of clientelism in order to appease the trade unions. The report expects, that the plan will create work for 200.000 of the 400.000 Dutch unemployed workers. The plan aims to stimulate the private sector, so that after three years indeed the borrowed capital can be paid off. The evaluation of the proposals in the report will first judge the structure plan, and next the crisis plan. The plan report gives a detailed description of the desired order, and in the process gets bogged down in rather utopic constructions. In a preceding column it has already been stressed, that the struggle for ordering is not a hallmark of the social-democracy. For instance, in the twenties of the last century the German SPD has energetically tried to erect a hierarchy of workers' councils, but she has finally abandoned that attempt. It is true, that some branches are indeed well suited for socialization or for a branch ordering, but it makes no sense to impose these instruments dogmatically on the whole economy. Therefore it is surprising, that the SDAP sticks to the demand for an ordered system during several decades. The preceding columns contain some reflections concerning the motives of the SDAP to stick to the PBO model. The reason is probably, that the person Troelstra, who has proposed an idea similar to the PBO, is highly respected among the Dutch social-democrats. Troelstra got the idea thanks to the couple Beatrice and Sidney Webb and the Fabian Society, who plead in favour of an economic parliament. Other SDAP leaders also feel congenial to the Fabian Society. Apparently, after the decease of Troelstra they have tried to create such a formula of the economic parliament, that it would be socially acceptable. Nevertheless, at least from a theoretical perspective the PBO is even less attractive than the centrally planned economy. An important factor may have been, that the Roman-catholic movement sympathizes with the idea of the PBO, albeit that she prefers the corporatism as the final goal, and not the socialization. Apparently, the ideology of the SDAP got derailed somewhat, and she has embraced the Roman-catholic corporatism11. Possibly she has hoped that the (confessional trade unions) Rooms-Katholieke Werklieden Vereniging and the Christelijk Nationaal Vakverbond would support her. Certainly the younger initiators of the plan are driven by their desire to participate in the government12. Incidentally, the plan-action and -propaganda have little effect on the various groups in their social pillars, and feel neither a need for socialization, nor for the PBO13. It is remarkable that the authors of all these reports confide in the ordering as the appropriate means for the mitigation of the economic crisis. The authors ignore, that any social process develops in a chaotic manner, and thus also the politics and the administration. Again and again the interests collide. There is too much trust in the common interest, that is supposed to be the guide for the policy14. In reality it is often impossible to discover the general interest. In the preceding column about the PBO it has been stated, that even the trade union merely represents particular interests, and ignores or belittles the general interest. In the same spirit the Belgian social-democrat Hendrik de Man justly remarks, that the trade unions are a community of fate, and not a community of ideas. The mutual relation is caused by the material interests. Therefore the unions are unsuited for controlling the economy. The crisis plan can obtain a more positive judgment than the structure plan. By and large it pleads in favour of the familiar Keynesian policy of economic stimulus by the intervening state. Nowadays the theory of Keynes (or the theory of spending power) is generally accepted, provided that she is applied with care. But some plan proposals give the impression, that it is apparently tempting to bind voters by spending the money of others. That is especially the case, when the crisis policy is derived from the conjuncture- and structure-policy, such as in the rationalization proposals. The possibly undoing of rationalizations is strange, as well as the subsidies for unprofitable enterprises. These plans are irreconcilable with the demand in the socialization report, that ordering must further a higher labour productivity. Nowadays, the ambition to industrialize the economy is also not convincing. The imperfections of the PBO and of the proposed creation of work give the impression that the SDAP in an opportunist manner has engaged in clientelism in favour of the trade unions, in spite of her verbal appraisal of the general interest. For, the elite of the unions would benefit from the establishment of the PBO. In fact they would directly participate in the management of the production. The elite would serve on the Branch councils, that determine the general policy in the branch. Moreover, they would enter in the supervisory boards of the enterprises. Here the SDAP generously hands out these positions, because the trade unions are an essential and allied factor of power outside of the parliament. Besides the SDAP uses the trade union as a welcome source of future politicians. It is essential for the SDAP to cherish her relations with the trade unions. Apparently the idea of an ordered exchange in the foreign trade is also a compromise between the SDAP, which in fact prefers free trade, and the NVV, which favours protectionism15. But the ordered exchange with other states is theoretically controversial, and is refuted by the later bad experiences in the Leninist states. The same can be said about the price formation by the BR. Yet another example: the plan wants to curb the conjuncture by accumulating large stocks, and this commodity capital is evidently unproductive. That capital is wasted. The socialization report demands, that the trade unions take on a cooperative attitude. But yet the intertwined organization of the SDAP and the NVV apparently leads to unsound compromises. The barter suggests, that in the decisions of the future CER and PBO the general interest will suffer as well. And this undermines the whole idea of ordering. So your columnist can understand, that the other political movements and the organizations of entrepreneurs are critical with regard to the plan. As a total program it is simply unsatisfactory. Yet the plan has its merits, because it wants to socialize the power to manage the private property, but not the property itself. For, this concession makes the social-democracy fit for participation in the government. The plan of labour contains so many unusual and utopic elements, that immediately after its publication the realization was inconceivable. That changes after the Second Worldwar. Any war will undermine the authority of the ruling order. And the post-war conditions differ so much from normal life, that the people are susceptible to experiments and alternative social systems. Therefore it is not surprising, that after the Second Worldwar the social-democracy prospers in all parts of Europa - just like after the First Worldwar. For this reason the socialists have always been hopeful in times of increasing social chaos. In the post-war period the government coalitions of social-democrats and Roman-catholics introduce a new order. That order imposed a sparing living-standard on the workers. 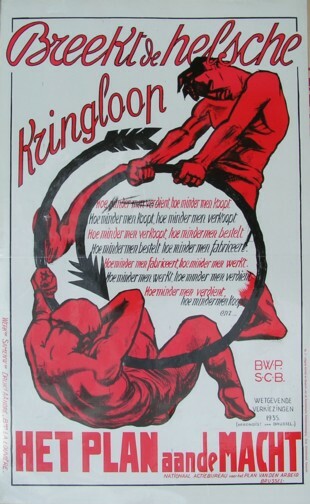 The SDAP and its successor the PvdA execute almost the opposite of the crisis plan, and press down the spending power. The trade unions integrate into the corporative regime of the new state. That reinforces the protection of the general interest, but undermines the wage struggle. In retrospect it is possible that during that period the prosperity of the people has been cut too much. This policy will be analyzed in a forthcoming column. Vos has presented the plan in a form, that can be supported by a majority op the population. Since until that moment the SDAP represented at most a quarter of all votes, consessions are necessary. The ambitious plans to socialize the agriculture are abandoned. Small farmers get a preferential treatment, perhaps for electoral reasons. In the plans for the retail trade the once extolled consumer cooperations are not favoured. Apparently the authors of the report shift ideologically away from marxism towards the corporatism. The socialist spirit remains, but the method does not. It is obvious that the hard-core marxists in the SDAP regret the new line of action. Besides, they are emotionally attached to the marxist rhetorics. In 1932 a faction secedes, and incidentally already in 1935 gets lost. Sam de Wolff does not join this group, but does write: "Those, who count on all classes for ordering, are like the man, who built his house on the soil without a foundation, and was surprised by the flood-tide; the house collapsed and fell apart. Build the foundation of order on the rock of the proletariat. Then the building is solid"16. In other words, whoever joins his opponents, runs the risk to end in the camp of the enemy. According to De Wolff the SDAP must advocate a policy, that favours all those, who are exploited in the production process. Everybody with a wage income belongs to the working class, including the paid director. The old middle class (farmers and artisans) defend their position in the hope to once join the class of capitalists. That hope is idle for almost all. De Wolff rejects the support and relief for the poor independent workers. The social-democracy must incite them to form cooperations, because these are very productive17. The new middle class, consisting of brain-workers, technicians and intellectuals, also belong to the proletariat. The workers in this class each try to acquire a leading position. It is obvious, that most of them will not succeed, and their education in itself does not guarantee a fair income18. De Wolff expects, that in the end they will also develop a proletarian conscience, and will support the demand for socialization. The prospering elite can only be convinced, when the party continues to explain with an unshakable conviction the theory of the class struggle. In short, De Wolff rejects the political tactics of Vos and his adherents. Besides, De Wolff believes that the economic theory behind the plan is flawed. According to Marx and De Wolff the conjuncture is an economic phenomenon, that is inherent to the capitalist production. As long as the economic system is not changed over to a complete socialization, the state is not able to mitigate the conjuncture by means of its own plan. The capitalist state lacks the power, and probably even the will. De Wolff even objects to Vos and Tinbergen, that their theory of spending power actually suggests the existence of a crisis in permanence. De Wolff denies, that the capitalist system can remain in a sub-optimal equilibrium. The pursuit of profit would always guarantee, that the optimal equilibirum is reached. It is an odd argument19. At the time De Wolff is perhaps the most important marxist theoretician within the SDAP. Many members value his judgment, especially with regard to the conjuncture. Therefore Vos has polemized against the conjuncture theory of De Wolff, which assumes cycles with a fixed period20. It is a somewhat shadowy discussion, because both debaters are right. For, it is certainly conceivable, that the economic prosperity behaves like a wave. But it is also clear, that the state intervention will always influence the future. Incidentally, the state intervention becomes meaningless, as soon as the conjuncture is totally unpredictable21. It is a pity that De Wolff and Vos were not able to compromize. The plan would have benefitted.